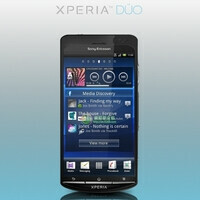 Frequent readers might recall the Sony Ericsson Xperia Duo, rumors about which started circulating the web last June. At that time, some claimed that the smartphone was bound to launch in September of 2011 becoming the company's first dual-core handset, but obviously, none of that came to pass. Fast forward almost a year into the future and we have a USPTO trademark filing by Sony Mobile hinting that the Xperia Duo might be real after all. The trademark was filed under "Mobile phones and accessories for mobile phones", and the filing itself is dated March 28. Sadly, the trademark filing for the "XPERIA DUO" name does not give out any clues whatsoever as to what kind of smartphone we are dealing with. It might be a device reminiscent to the one that leaked last year, or it could be an entirely new design. One thing is pretty certain, however, namely that if the rumored Sony Xperia Duo ever materializes, it will sport a dual-core processor. The remainder of its hardware specs are anyone guess right now, but if the device is real indeed, the rumor mill will probably start filling in the blanks pretty soon. Please Sony, make one with Windows Phone. The two of you combined will be the ultimate phone. Totally AgreeD!! :-D Sony + WP! Please make it to Verizon with LTE. My bet: dual boot Android and WP7.5!